Last week, my little sister, Briana, passed away. While this site is primarily a vehicle for my professional pursuits, I felt it was an appropriate canvas upon which to pay tribute to not only my blood, but also a fallen artist. Briana has long been an artistic inspiration to me—she has inspired both my writing and filmmaking. 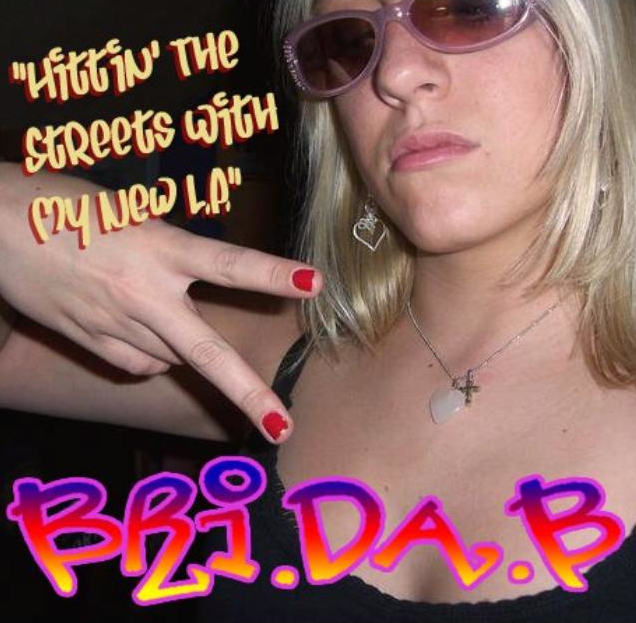 My novel, “No Alternative,” would not have been possible without Briana—she is the genius behind the lyrics of Bri Da B and her personage was a springboard from which the life of the fictional character Bridget Harrison sprung. Bridget is the character I admire the most. When my parents asked me to deliver the eulogy at her funeral, I embraced the task—as best as I could under the circumstances—because I knew my sister would want me to write it as though it was, itself, a piece of art. It’s a tall order, and I’m not sure I succeeded, but I know she would have liked me to try. I consider this the most important writing assignment I’ve ever had, and I can only hope she’s happy with the finished product. First and foremost, thank you all for coming today and being here for my sister, Briana. It means so much to me and to our family. I’ll ask you to forgive the somewhat scattered nature of this address, but such is the nature of life, of memory, of the bits and pieces of the everyday that both distinguish ourselves as individuals, and tie us all together as one. These words I’m reading were written in Briana’s room—the room where she grew up when we were kids. It has since become the room I occupy when I visit the East Coast, and that’s because the moment I moved out, my father turned my old room into his office. I’m not sure I’m even allowed in it anymore. Her drafting table, where she created a lot of her artwork, has become my desk away from home. I wrote my novel there. And there was a reason for that: she had left her artistic mark upon the surface of that table, her residue of creativity, and I had always hoped I’d be able to harness just a little bit of her talent and funnel it into my own artistic pursuits. There’s a beginning to every story and this story begins something like this: when my mother was pregnant for the second time, she was lounging by the pool at my grandparents’ house, dipping her feet in the water, and my dad was videotaping it. He zoomed in on my mom’s belly and asked what was in it. I was five years old, scampering around the yard, and chimed in: “That’s Bri!” “Bri!” My dad responded: “Yes…after the cheese!” Until just last week, I would have sworn my sister was named after a hunk of coagulated milk curd, a cheese that was perhaps the object of my mother’s prenatal cravings. In truth, Briana was named “Briana” because it’s Gaelic for “The Strong One.” And strong she was. Strongheaded. What can I say? She was Irish. Briana was one of a kind; she not only loved art, but was also an extremely talented artist herself. I’m not just saying this because she dabbled here and there; I’m saying it because she was a true artist. She put her heart and soul into her art—her entire life was a canvas on which she asserted a style, a personality, and a truly unique way of looking at the world that not only affected me, but I’m sure affected a lot of the people sitting in this room. Anything Briana put her mind to and decided to learn, she did, and did herself…except for the guitar; I’ll take some credit there. I taught her the power chord. For those who don’t play guitar, if you know one power chord, you know them all. We would both practice together—when I’d play Nirvana songs, she’d play Hole songs. But ultimately, the guitar wasn’t for her. It was too conventional. While my band pursued the spoils of alternative rock, Briana decided to rebel against the mainstream and become a gangsta’ rapper. Briana recorded as Bri Da B and made two albums, “Around The Motherf***ing World” and “Hittin’ The Streets With My New LP.” She toured locally, performing at venues in Westchester and New York City. Her songs, “Gravy On Top,” “Print It” and “Pimptooth” were bonafide underground hits; at Fordham University, bootleg tapes and CD’s of her music circulated around campus and the buzz caught on. I can’t quote the majority of her lyrics here, unfortunately, for fear of being struck by lightning. When I said Briana was one of a kind, it wasn’t just a platitude. Several years later, a version of “Pimptooth” was covered by the cyberpunk collective ORDER44 and produced by the producer of the bands Interpol and The National. At the age of eleven, Briana started painting with oils, and later mastered several mediums. Ultimately, pastels became her favorite means of artistic expression. She painted landscapes, still-lifes and portraits. 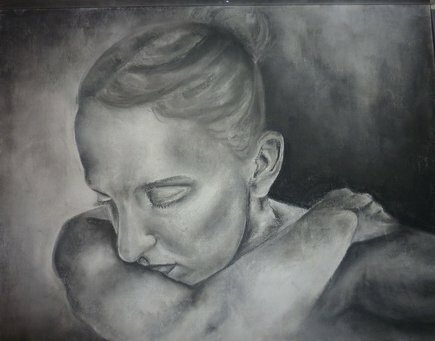 As a student at the Ursuline School in New Rochelle, she was awarded First Prize at her senior year Art Show. She created many works, both for her pleasure and professionally on commission. She admired the work of Salvador Dali, Rene Magritte, Hopper and the images of Alfred Hitchcock, Tim Burton and David Lynch. She was able to harness her emotions, which were at times unstable, and channel them into her art. The way Briana saw the world wasn’t like the way others see the world, which is the gift and the burden, of a great artist. 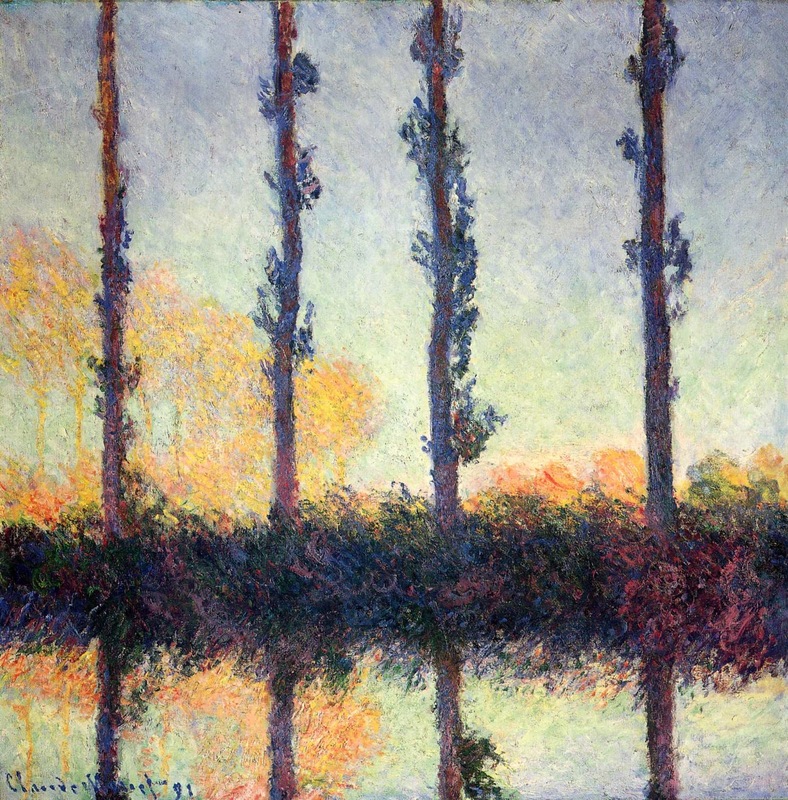 Her favorite painting was Claude Monet’s “The Four Trees.” He painted the poplars from the limited perspective of a boat in the middle of a river. If he had painted them on the land from the opposite bank, the perspective would have been much greater. This has the effect of denying us the view of the tops of the four trees. Furthermore, were it not for his depiction of the riverbank, the tree trunks would be indistinguishable from their reflections in the water. In college, Briana wrote a fifteen-page paper on this one painting; I’ve never read the paper, nor do I know where it is today. But she certainly thought the painting merited such an analysis and it was clear that she loved it. When I look at the painting, and try to imagine how my sister saw it, I’m struck by the fact that it isn’t a complete picture. Perhaps it’s a suitable analogy of life, and in this case, her life: we will never have a complete understanding of it. However, we must embrace the parts we don’t see, because those are the parts we will miss, the parts that matter, the parts that, through faith and love, we know are true and pure and real. We cannot see below the trees—the roots, the dirt, the elements that give life to the trees. We cannot see the treetops, nor do we know where they end—they may end shortly beyond the edge of the painting, or they may extend further than we think. And what’s above the end of the trees; well, that’s a question as old as time. The importance of the painting lies in its focus on the middle. There is comfort in the middle—there are no highs, but there are no lows—there is stability, there is symmetry, there is equality. Our lives are limited, in length and in perspective—we can only see so much—but our lives extend beyond the scope of our limited resources. Briana’s life extends beyond her own into each and every one of you. Her life extends beyond her own and into her family, into her beloved husband, Anthony. When asked about Anthony, Briana would often respond quite simply: “He is not only the love of my life; he is my life.” Anthony, you meant the world to my sister; and my family and I couldn’t be happier you both found each other—I have no doubt you will find each other again. Perhaps the four trees in Monet’s painting are Anthony, my mother, my father and myself—the past below us and the future above us—and this is the perspective through which my sister can see us now: she is with us in the present, and her presence extends to us boundlessly into the past and boundlessly into the future. We have become the impression that is perceived by my sister wherever she is now—or that’s how I’d like to think of it. I’d like to think of myself as the way she would paint me on the canvas of her perpetual imagination. This Monet painting never meant a lot to me, but now it has become a symbol of Briana, and it means so much more. Briana often had trouble realizing that people loved her as much as they did. Today is a testament of how much people really do love her. She had a hard time seeing and accepting what was so obvious to me and everyone else. But my family and I take great solace in the fact that there is so much love around her, and it’s this love that will keep her memory alive on this earth. As a writer, I contemplate death a lot. My death, the deaths of my family members, including the death of my sister. It has fueled my art. My novel, while a work of fiction, was born from what I imagined my worst nightmare to be; I wanted to write about what scared me the most. And what scared me the most was losing my sister. Now, tragically, my worst nightmare has come true. However, in writing about it while my sister was alive, she had the opportunity to understand how very much I loved and cared for her—she said she looked up to me as an artist, but the truth is: it was actually me who looked up to her. She was, and will continue to be, my artistic inspiration. And I got to tell her that. For that opportunity, I am supremely grateful. 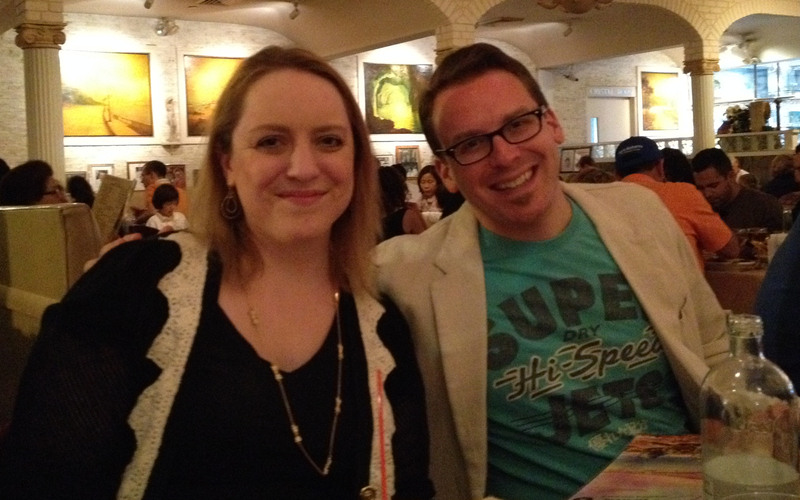 As a tribute to my sister, I, along with her husband, Anthony, my wife, Rachel, and our brothers-and-sister-in-song, Jay, Alli, Liam and Andreas, recorded one of her favorite songs—the song we performed at her funeral—“Hear You Me,” by Jimmy Eat World. Please feel free to listen and share and celebrate the life of Briana Dickerson Cardone. Beautifully written and I am sure spoken. Find peace in the memories. I’m so sorry to hear about your sister. Your eulogy is a beautiful tribute. May she rest in peace! This is beautiful, Will. She sounds like an amazing woman, and I think she would be honored by your words. Sending love to you and yours. How touching. You can feel the love and heartbreak all together. My thoughts are with you guys in what must be such a difficult time. Briana will live forever in her art and those she loved. I’m very sorry for you and your families loss. May God surround you with His love and comfort your hearts.